Why shouldn't Doctors lie when the entire cancer industry is one gigantic fabrication from start to finish? Is it any wonder that cancer societies worldwide put a far greater financial initiative on chemotherapy and radiation research than disease prevention techniques? Preventing disease doesn't make money, but treating disease certainly does. Were his patients shocked? You bet they were. Who would ever suspect a Doctor of faking a diagnosis to collect money. It's unconscionable. Yet it happens with cancer and almost every disease that medical doctors can generate income through kickbacks and commissions based on the volume of patients treated with specific pharmaceuticals. Like anything people are used as a commodity. 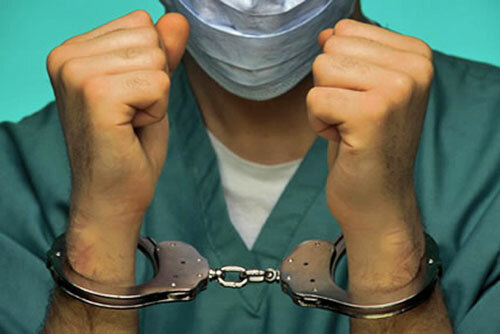 "Many of these unscrupulous Physicians are like businessmen without a conscience. The only difference is they have your health and trust in their hands - a very dangerous combination when money is involved," said Dr. Sayed Mohammed, a retired Oncologist who admits seeing the trend more than a decade ago. "It is my choice," Fata said on Tuesday of his surprise guilty plea, which included rattling off the names of numerous drugs he prescribed for his patients over the years. "I knew that it was medically unnecessary." U.S. Attorney Barbara McQuade said she plans to seek life in prison for Fata, calling his case is "the most egregious" health care fraud case her office has seen. She said Fata not only bilked the government - which is typical in such cases - but he also harmed patients. Prostate cancer is another great example which doctors falsely give prognoses about without giving patients the facts. A prostate (PSA) blood test looks for prostate-specific antigen, a protein produced by the prostate gland. High levels are supposedly associated with prostate cancer. The problem is that the association isn't always correct, and when it is, the prostate cancer isn't necessarily deadly. The PSA test usually leads to overdiagnosis - biopsies and treatment in which the side effects are impotence and incontinence. Repeated biopsies may spread cancer cells into the track formed by the needle, or by spilling cancerous cells directly into the bloodstream or lymphatic system. More than 90% of Doctors who encourage cancer treatment for prostate cancer will generate a commission from each treatment the patient receives. It proves risky and often deadly in the long run for most people who don't understand how to take care of their health and are persuaded by false statistics. Dozens of excellent large studies have been done on men who have had cancer discovered in their prostate with a biopsy. In over 97% of the cases this cancer either never spreads outside of the gland to cause harm or the patient dies of something else long before any evidence of cancer spreading outside of the prostate occurs. In that 3% where cancer is aggressive and harms the patient, it has already spread beyond the limits of surgical resection long before discovery; thus, these men are not helped by surgery either. After at least seven years of post-college graduate medical education on the emotional, mental, and physical condition of the human being, you would expect a physician to be a powerhouse of goodwill for his or her patients. Unfortunately, too many doctors fail to keep the welfare of their customers at the forefront, as their main concern. The needs to boost their own egos, self-preservation, and the quest for more money often result in inappropriate care and harm to the patient. Breast cancer screenings also result in an increase in breast cancer mortality and fail to address prevention. Despite no evidence ever having supported any recommendations made for regular periodic screening and mammography at any age, malicious recommendations from the Society of Breast Imaging (SBI) and the American College of Radiology (ACR) on breast cancer screening are now suggesting that breast cancer screening should begin at age 40 and earlier in high-risk patients. Published in the Journal of the American College of Radiology (JACR), the recommendations released by the SBI and ACR state that the average patient should begin annual breast cancer screening at age 40. They also target women in their 30s if they are considered "high risk" as they stated. Chemotherapy boosts cancer growth and long-term mortality rates. Most chemotherapy patients either die or are plagued with illness within 10-15 years after treatment. Patients basically live in a permanent state of disease until their death. The cancer industry marginalizes safe and effective cures while promoting their patented, expensive, and toxic remedies whose risks far exceed any benefit. This is what they do best, and they do it because it makes money, plain and simple. The reason a 5-year relative survival rate is the standard used to assess mortality rates is due to most cancer patients going downhill after this period. It's exceptionally bad for business and the cancer industry knows it. If they did publish the long-term statistics for all cancers administered cytotoxic chemotherapy, that is 10+ years and produced the objective data on rigorous evaluations including the cost-effectiveness, impact on the immune system, quality of life, morbidity and mortality, it would be very clear to the world that chemotherapy makes little to no contribution to cancer survival at all. No such study has ever been conducted by independent investigators in the history of chemotherapy. The only studies available come from industry funded institutions and scientists and none of them have ever inclusively quantified the above variables. Why? Money, greed and profits run the cancer industry - nothing else. The cancer establishment must retreat from the truth to treat cancer because there will never be any profit for them in in eradicating the disease. There is no governing body in the world that protects consumers from being subjected to these toxic therapies or even known carcinogens in our foods our environment, because that too, will prevent the profits from rolling in. It's a business of mammoth proportions and must be treated as such. The most powerful anti-carcinogenic plants in the world such as cannabis must be demonized and be made illegal because they are so effective at killing cancer cells without side effects. Cannabinoids are so efficient at treating disease, that the U.S. Government patented them in 2003. If a "magic bullet" were used FIRST by orthodox medicine, meaning the cut/burn/slash/poison treatments were avoided, a 90% true cure rate would be easy to achieve. But the fact is that the leaders in the medical community have absolutely no interest in finding a "magic bullet." A "magic bullet" would cost the drug companies hundreds of billions of dollars, and patients would have less hospitalization and less doctor visits, etc. You might ask your oncologist why your chances of survival are only 3% (ignoring all of their statistical gibberish such as "5-year survival rates" and deceptive terms like "remission" and "response"), when your chance of survival would be over 90% if they used something like DMSO. Actually, bring up DMSO to any oncologist and most of them won't even talk to you about it. Why? Because DMSO is a natural product, cannot be patented and cannot be made profitable because it is produced by the ton in the wood industry. As we continue playing this charade of making the public believe that poisons treat cancer, people will continue to die, and Doctors will continue to make money up to the day of their patient's death. Every once in a while, we may catch a few (of the many) like Dr. Fata, who self-destruct due to their own greed. We will claim they are outlaws, banish them and tarnish their reputations based on a perception that a healthy person should never be unnecessarily subjected to chemotherapy for money. justice.gov - United States of America vs. Farid Fata, MD.